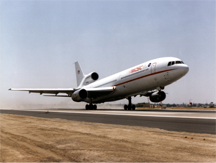 A Lockheed L-1011 Tristar aircraft like the one flown by Eastern Airlines flight 401. On the night of December 29, 1972, Eastern Airlines flight 401 crashed into the Florida Everglades on approach to the airport in Miami, causing 101 fatalities. As is the case in most disasters, the outcome was the result of multiple contributing factors, including the design and operation of the autopilot. Still, one of the contributing factors was the problem-solving approach used by the cockpit crew when they discovered that the landing gear indicator light would not illuminate to indicate that the landing gear were down and locked. Believing that the autopilot was guiding the aircraft, the crew focused essentially all its attention on solving the indicator light problem, and did not realize until too late that the autopilot had disengaged. In a now-classic example of Rearranging the Deck Chairs, group dynamics — abetted by cockpit control system design flaws — led the crew to focus on a less-important aspect of the overall problem of landing the aircraft safely. Photo by U.S. National Aeronautics and Space Administration courtesy Wikimedia. The purpose of many meetings is solving specific problems. We bring people together to collaborate because we seek contributions from a variety of sources, and because we hope people will think in new ways. Usually, it works. But creativity can be misdirected. Just as we can combine our talents, skills, and knowledge to solve problems, we can collaborate to avoid solving those same problems. If we educate ourselves in advance about the common approaches to not-solving problems, we can more easily recognize these patterns, even when we're participating in them ourselves. Here are a few of the more common ways groups avoid solving the problems they believe they're solving. Even though these tactics are group phenomena, I've given the name Oscar to the obstructor, and the names Paul and Pam to proposers of solutions. When Paul proposes a potential solution, Oscar says, "Yes, but…" and then reveals additional information that rules out Paul's proposal. One motivation for Yes-But can be Oscar's sense that since he's stumped by the problem, solution by the group — or by anyone else — reflects badly on him. When Pam proposes an approach, rather than addressing it or commenting on it, Oscar raises another problem, possibly unrelated to Pam's idea, thereby deflecting the group from considering the proposal. solving those same problemsis especially useful when Oscar doesn't immediately know how to apply Yes-But. When he can't see anything wrong with Pam's idea — or when he simply doesn't understand it — he can still deflect the group's attention. Sometimes the group collaborates in addressing something that's either unimportant or irrelevant or both. This special case of Deflecting is sometimes known as "Rearranging the Deck Chairs on the Titanic." Groups that often do this might be lacking in leadership, but replacing the leader rarely helps. It's usually a group dysfunction. In Diversion, Oscar (or somebody else) uses anger, conflict, humor, or other techniques to focus attention anywhere but on the proposed solution. One favorite: "What's for lunch?" This approach is useful when Oscar can't think of another irrelevant problem for people to consider. People dedicated to this pattern apply their intelligence — creatively — to demonstrating their intelligence. For instance, Oscar might withhold key information until needed to disprove the viability of a proposed solution. Or he might "info-dump" — emit a stream of information at such a rate, so filled with jargon and acronyms, and so disorganized as to be indigestible. In that form, the pattern might be called "You can't catch up to me." This style of participation in group problem solving is best treated as a performance issue. Would you like to see your comments posted here? rbrenAswUGZxsTcODPfxWner@ChacgfYxqwLlTBMrlAWZoCanyon.comSend me your comments by email, or by Web form. See also Problem Solving and Creativity and Effective Meetings for more related articles. I offer email and telephone coaching at both corporate and individual rates. Contact Rick for details at rbrenpvSDlgeThXyQLXAkner@ChacXQDdfvPpvqDKaofUoCanyon.com or (650) 787-6475, or toll-free in the continental US at (866) 378-5470.